I did a Livestream on the topic & used this is the graphic. I also encouraged parents to let them run & play after the sweets. 🍭 So they can burn off some of that crazy sugar. Here is the Livestream I did on Facebook. My son with his Auntie. “No” & limits. Sometimes we feel obligated to give them what they asked for but less is more. Teaching our little ones portion control is the first phase to a healthy lifestyle. And they learn by example. Sharing is caring. They don’t have to eat the whole lot. You can use this time to teach them about the joys of giving. Now technically they didn’t purchase the candy but in a child’s mind they OWN it. Hydration goals. Keep them hydrated to support a healthy digestive system. And if you’re like me you’ll probably have them drink some un-sweetened chamomile or peppermint tea. Read labels. 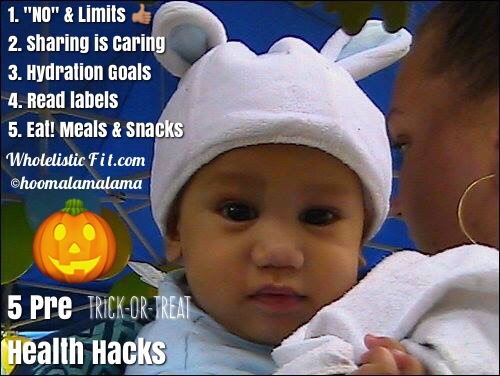 Please don’t assume that all food based businesses want your kids to grow up healthy & strong. The servings per container guide & ingredient list is crucial. Also, small wrappers won’t have the list but you can research. Simple rule: If you can’t pronounce it, why eat it? Eat! Meals & snacks. It’s not a good idea to skip out on meals. And if possible, make sure dinner is extra delicious and nutritious. And like I mentioned before, let them play-it-off. Burning the sugar intake will help them release all sugar. Be safe. Or create your own smoothie with these basic tips.